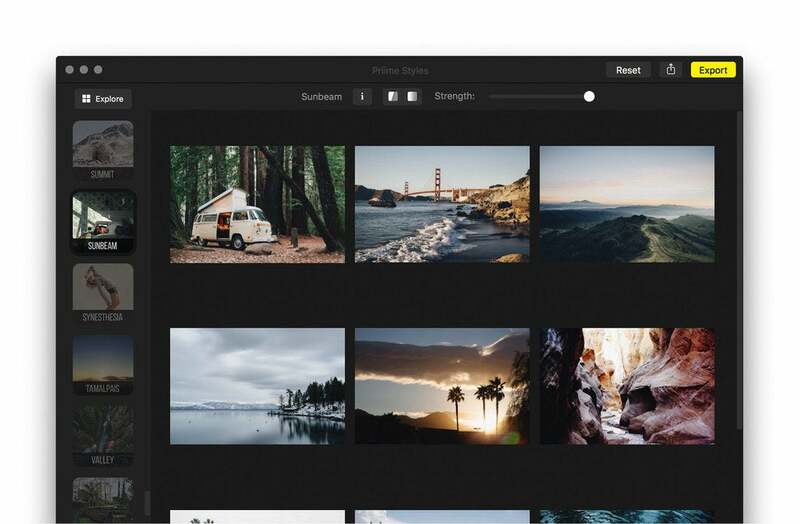 Delivers 101 professional-looking photo filters via a standalone app or extension support for Photos and Lightroom. It’s not hard to spice up photographs in just a few clicks of the mouse these days. The more difficult part of the process is finding an app with quality filters worth using—and one of the better mobile solutions around has finally made the leap to the desktop. Priime Styles ($30 on the Mac App Store) is a Mac version of the popular Priime photo editor for iPhone. The two apps share the same impressive catalog of “styles,” what we typically refer to as one-click image filters or presets. Created by dozens of the world’s top photographers, there are over a hundred styles to choose from—101 to be exact, although the apps offer them up in different ways. 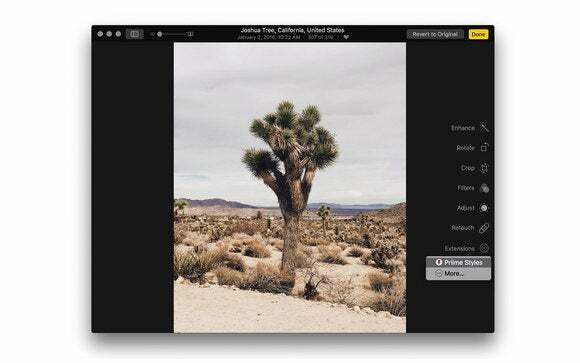 Priime Styles offers a clean, standalone Mac app for applying one-click filters that can enhance photos in almost any file format. Priime for iPhone (iTunes Store link) is free to download, requiring a $10 in-app purchase to unlock everything. By comparison, the Mac version includes the entire lineup out of the gate, but at three times the cost. This type of pricing disparity is fairly common with mobile and desktop software, but in this case the two apps aren’t exactly equals. For starters, Priime Styles isn’t really a photo editor at all. It’s more a gallery of one-click filters that can be applied to imported images which can be shared or exported. There’s a sole slider for adjusting the strength of the applied filter, whereas the iPhone app offers crop and rotation options, as well as an arsenal of image adjustment tools. Although that sounds disappointing, Priime Styles makes up for this deficiency in other ways. 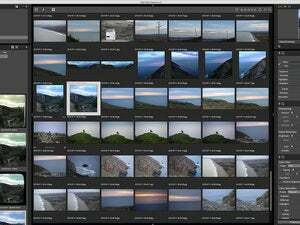 The Mac version directly integrates with Adobe Lightroom catalogs, providing a far richer palette of editing options, along with non-destructive extension support for OS X Photos, a feature not offered on the iOS version. The standalone version of Priime Styles can be used to apply a single filter to a batch of images at once. The standalone Priime Styles is a fairly minimalist affair, featuring a dark user interface that can be navigated via keyboard, with a scrolling ribbon of styles along the left side. Just about every conceivable image file type is supported, including JPEG, TIFF, PNG, and a wide assortment of raw formats. One nifty feature is the ability to open multiple photos and apply one filter with a single click. There’s support for full-screen mode, which is perfectly suited to working with more than one photo. Buttons at the top allow users to preview the original unfiltered image, or side-by-side split view, which also works in batch mode. The Info button provides detailed information for the selected style and which type of image it was designed for. If the sheer number of available choices is too much, click the Explore button to display the currently-selected image as a grid of thumbnails with styles already applied, making it easier to pick the right one. Mac users can apply Priime Styles directly within OS X Photos, thanks to extension support. As an OS X Photos user, I was most interested in how Priime Styles worked as an extension. I’m happy to report it’s almost exactly the same experience as the standalone app, minus batch editing and sharing/export options. Styles tend to be on the conservative side, but they’re good quality and a nice way to punch up lackluster photos. Priime Styles lacks the image editing tools of its iPhone equivalent, but with so many filters to choose from and OS X Photos/Adobe Lightroom support, you won’t care. 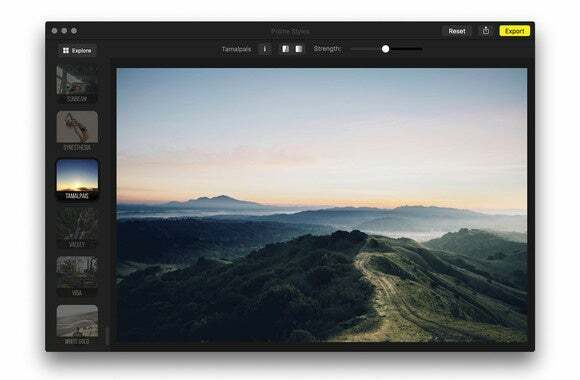 With more than 100 photo presets created by the world’s best modern photographers, Priime Styles for Mac delivers a professional look via the standalone app or extension support for Photos and Lightroom.